High Quality 23 AWG Solid Bare Copper Conductor, 100% bonded Foil Shield and 95% tinned copper Braid Shield. Small O.D. enables a 1.5" bend radius - ideal where space is at a premium. 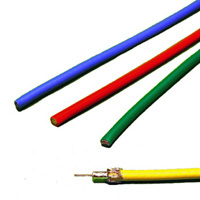 This cable meets SMPTE Broadcast Digital Standards (SDI), and is SDI rated to 4.5 GHz. Mini RG59 75-ohm video coax, bonded foil. Nom. Capacitance (Conductor to Shield): 16.3 pF/ft.